Its fascinating past, impressive gardens and richly-varied programme of cultural events combine to make la Roche Jagu a must ! 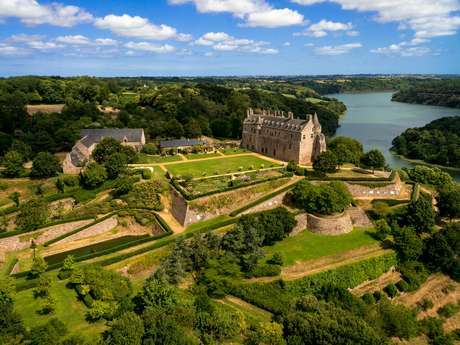 Built in the 15th century, the château de la Roche Jagu is a very beautiful fortress which proudly watches over the estuary of the Trieux river, owing its past strategic importance to this dominant location. Today, the rampart walk offers a breathtaking panorama across the valley. Designed as a residence - in spite of its rather military appearance - today the château hosts performances, fun activities, workshops and temporary exhibitions to fascinate and delight visitors of all ages ! Nature lovers will enjoy strolling through the château grounds, which have been awarded ‘Eco Jardin’ and ‘Jardin Remarquable’ status. The beautifully landscaped gardens have been designed to invite contemplation and reflection.